Model T Ford Forum: Holy C@#$ - are drivers getting bad! Holy C@#$ - are drivers getting bad! Model T Ford Forum: Forum 2018: Holy C@#$ - are drivers getting bad! I have never experienced such bad drivers as I have in the last 12 hours. Last night went out for a drive, a couple blocks from home, As I just start to slow down for a stop sign, a middle aged lady in an older Silver Buick Regal passes me, (double solid line) while texting! This morning took the T to work and a guy about the same age, passes me in the parking lane, driving an older White Buick Regal, about the same age! Both times I was doing the speed limit. I have seen my share of bad drivers, but not like this! Sounds like the problem is Buick Regals. I happened to get cut off by one such moron the other day and it was very satisfying indeed to see that less than a mile up the road, the Highway Patrol had pulled the SOB over. -As he had out-of-state plates, it's unlikely such a display of defiant reckless driving would draw only a ticket. -I hope the handcuffs were brand new with sharp edges. Idiots are why I refuse to drive anything newer than 1970. I like lots of steel between me and everyone else on the road. the rules for "double yellow lines" has changed too. Even a single solid yellow also for that matter. Stopped at a light in the T in a dedicated left turn lane. Multi lane roads. My left turn signal on. Light changes & I start to go. Guy pulls out behind me on my left and makes the turn. Would have cut me in two. My last street drive in a T. I'm done. 3 maybe 4 yrs back. The road I live on is 30 MPH and double yellow the entire 3 mile length. I have shade trees that cover the sidewalk so the Motorcycle officers like to park there and write tickets. I do provide them with Ice water if they want it. Yesterday I heard this loud voice telling the officer that it was not illegal to pass on double yellow lines because he did it all the time and this was the first time he had ever gotten a ticket for it. GO Figure! I believe we all experience this behavior on the roads. IMHO a big part of the problem is that traffic laws are, for the most part, unenforced or under enforced. I believe local law enforcement agencies have shifted priorities over the years and traffic enforcement is far from the top of the list. In our area, in spite of violations everywhere, a person getting cited is rarely seen. "Hat on backwards" and many other drivers do as they please because they have learned there are no consequences. It would be very interesting to examine annual traffic citations numbers and correlate that information with traffic collisions, injuries and fatalities. I'd bet anything a direct relationship would be established. Please note that this is NOT a criticism of law enforcement officers. The problem is much higher up the food chain and rests with the political management priorities set by political leadership. 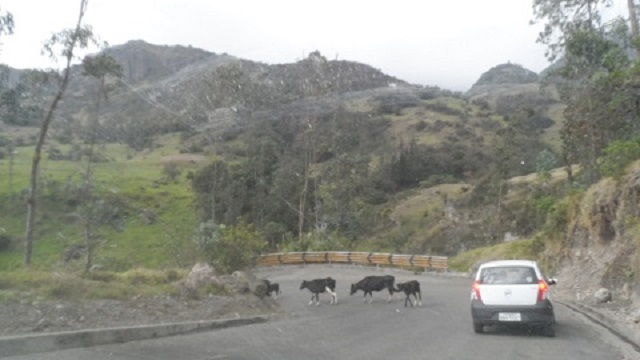 While we love the adventure we're living in rural south Ecuador, you guys have it easy Here there is absolutely NO regard for road rules. Any color dividing lines are considered decoration. And stop lights/signs are not obeyed as they appear to be suggestion only. Our last delivery from the states was a front/rear dash cam DVR combo. As the "gringo" we're always at fault and the camera has saved our butts on a couple of occasions. Glad you posted this. I was starting to think we had all the bad drivers. For some dumb reason the city has decided to take out a much needed traffic lane all over town and make it a bicycle path. Never seen a bike use it but a few drivers seem to think it is a 65 mph passing lane. So there I am in my T having a great ride to work. Other drivers taking pictures, waving and enjoying the old car and out of nowhere some fool blows by in that bike lane at the speed of light and stays in it for an entire block. I agree it seems like traffic enforcement could be better. Scott, you posted as I was typing but that sort of traffic jam is typical of here too. Has anyone else been told by an officer that they had been asked to stay out of the area by the "Home Owner's Association"? I had "Good Cop/Bad Cop" show up in my driveway when I called to complain concerning reckless driving on my street. I was told that enforcing the statutes are at their discretion and that the department had been asked to not routinely patrol my neighborhood on certain days. I guess all I need to do if I plan on performing an illegal activity is to call and ask them to stay out of the area. HA! I come from a family that has several police officers. I agree that the problem is with the "higher ups" wanting to make headlines. I live in a "cattle rich" environment up here. 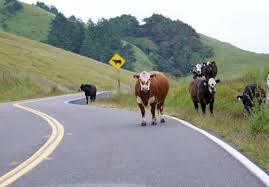 Lots of ranches, lots of cattle driven on the back roads and highways to winter and summer feeds. I dearly love it when a "flatlander" winds up in the middle of a herd, unable to move and their nice shiny car gets covered with cow poo. I even saw one cow stick its head in the window out of curiosity and the woman inside screeched in terror. At least you can get ethanol free gas for about a buck and a half per gallon. Hey Gary. Uh,,,,,,,,,,,, yeah. The same but different. Great looking country you got there. I learned to drive in a High School classroom where we spent many hours learning the vehicle code and spent many hours driving a simulator before we ever got behind the wheel of a real car. Now it's an online course, probably less than an hour, and a couple of hours behind the wheel of a driving school car, and then you're off to the DMV, where they don't even test for any driving skills like parallel parking, "Y" turns, "U" turns, etc. That's why current drivers can't get their little Prius all the way into their own traffic lane, can't back up, and can't even park their car! How often do you see someone make a u-turn just anywhere including the middle of the block, over double and even double double yellow lines? They didn't want to wait in the left turn lane to make their u-turn, so they went through the intersection and doubled back. What really annoys me are the ones who don't or can't think ahead and plan where they need to be, change over two or three lanes at almost 90 degrees to make a last minute turn, or get in the leftmost left turn lane on a double left and then immediately cross through and cut off cars in the right lane because they need to make a right into the first driveway! They are learning to drive by playing video games where there are no real consequences. The object is to go as fast as you can, weaving through the other traffic to beat them to the finish line. If you hit another car, you just spin around a little and then go pedal-to-the-metal again. There are no fires, no deaths, only delays which then require you to go faster to make up the time. 3x in the past seven days, I'm driving the speed limit when a driver passes me in the city, pulls back in the same lane, then hits the brake to turn right. Considering getting a dash cam to prove to the officer that the accident was not because I was following too close. I think additional policing is needed, but not necessarily the issue. I would guess most of us got our driver's license when we were somewhere between 16 & 20 years old. As long as we pay our renewal fee on time, we never have to take the written or practical test over. Teachers, doctors, daycare providers and may other professions have to take so many Continuing Ed (CE) courses every few years to keep their licenses. But driving a car does not require any additional effort to ensure we know what they are doing, or what changes have occurred. Personally, I have no issue if every time I had to renew my license if I had to take the written driver's exam, or some other version of it. Then if we fail it X number times having to follow up with taking the practical test. I fully expect this would reduce the craziness on the road. I get the feeling that most people think driving is a right and not a privilege, along with this, we are becoming a "Me first Society and I am the President and CEO of my local chapter" so get out of my way. Time to get off my horse, and get back to work! Ah heck young ones have been doing the in out traffic weave for many many years. Watching traffic, I don't see anything "NEW" but I do see more of it. Like stop signs, they are not a slow down and blow thru, it's a stop sign. And let me tell you it isn't just the kids doing it, it's people our age too. What is a mirror doing on my car? I don't see you, so stop pretending to be there! GET OUT OF MY WAY! Jason, you just reminded me of when I took a friend to get her state ID card and someone at the DMV gave her the wrong ticket and the Drivers license examiner came over and said Gwen if you will come with me we will get you started on the written test. Without missing a beat as she pulled down her sunglasses she said sure do you have it in braille? I'm surprised that there are rude drivers in other states! My experience has been that when I drive in other states, I can set my modern car on cruise control and almost no one passes me and I seldom pass anyone else. When I cross the state line into California, The slow lane is going too slow and the fast lane too fast! I see a slow moving vehicle ahead so I pull over to pass it and the car which was right behind me in the slow lane rushes by on my right and squeezes between me and the vehicle I am passing! They were behind me for a long way and could have passed me before I pulled over. Another thing I notice is that many cars speed up and then slow down. If they are going slow I pass and then they speed up and pass me. It gets worse as I get closer to Los Angeles or San Francisco. I think the California Highway patrol is to blame. I very rarely see them pull over anyone who breaks the law. Mostly they arrive at crash sites. I'm probably a bad drive in most of your eyes. I drive 10 mph over the posted speed most anywhere I go. That is about what the local law enforcement allows. I take as much of it as I can. I set my cruise and have never been pulled over doing that. I drive 80 miles each way to work every day. 50 miles of it is on a lightly traveled interstate. When I change lanes, it is usually so far away from another vehicle that letting them know my intentions will have no effect on what they are doing, so I usually don't bother. If I am 100 yards behind you and no other cars around and I swap lanes, what would you do differently if I had let you know ahead of time I was changing lanes? Same for after I pass you. If I am 100 yards in front of you going 10-15 mph faster than you, what would you do differently if I told you I was coming back into your lane? Occasionally, I have the opportunity to drive in Atlanta. Up there, if you use a turn signal to tell someone you want over, that is the quickest way to find out how much horsepower they have, because I can assure you they will floor it to prevent you from coming over. Oh, and normal speed through Atlanta unless there is a traffic jam, is probably 75-80 in a 55. You do 55 (Posted speed limit) in Atlanta, you are going to be killed. So......While we are talking about our pet peeves.....I work just outside of Savannah. I take I-95 to my exit and turn right. There are two left turn lanes and one right turn lane at the bottom of the off ramp. There is a traffic light there, but a Yield sign for traffic turning right. The road you are turning onto is a divided 4 lane. There are a lot more people turning right in the mornings than turning left. It sometimes results in traffic backed up the full length of the off ramp. The courteous law abiding (unless you count going 10 over and swapping lanes without signalling) citizens will move over to the right to allow drivers turning left to go on down the ramp to the light. You would not believe the number of cars that will pass all those other cars that are turning right so they can go down to the light and turn right from the rightmost left turn lane. Pisses me off! You have to wonder if those same people would walk into a crowded McDonald's and just go to the front of the line and place their order. I bet they wouldn't because they would be afraid someone might kick their @$$ for trying. What the difference? Guess they think no one is gonna pull them out of their car and kick their @$$. Believe me, the thought has crossed my mind. Speaking of Alanta my first time through i saw shocked to see people drive to the end of a on ramp and stop.Bud. The reason to use your turn signals even if NO ONE is there is so it is a natural habit so you'll be doing it when someone is there. Of course, I'm also thinking that there's no need to add turn signals to my car since almost no one uses them on cars that have turn signals. . . .
See the same here in AZ. Speed limit signs appear to be mere suggestions. No one seems to obey the speed limit anymore. Enforcement isn�t what it used to be as well. At one time there were numerous speed cameras, there was such a hue and cry about them, most have been removed. A sign of the times? I had a guy on a motorcycle pass me on a double yellow on friday less than a 1/4 mile from a stop sign. I was driving the T and couldn't help but thinking why would you want to be in front of me stopped at a stop sign on a motorcycle. Well forgive me if I sound mean but I have noticed a trend lately of folks that are to old to be driving. Several times lately I have been in traffic and there was a old woman or man that could not hardly see over the steering wheel going 30 in a 55 on a main hwy. People taking chances trying to get around,horns honking.No need to honk the horn at a old person,they can't hear and don't give a rat's rear end anyway.When I politely ask a old man 1 day if he realized how slow he was going , he told me to go to ---- he would push the car if he wanted to.He went on a rant how he was a veteran and he was this and that and he could drive as slow as he wanted. Not long after found out he was rear ended. Um,I wonder if he still feels that way? I feel like the drivers test should be done on everyone under 30 and over 60.I think we would all be shocked as to how many would be put walking. On another note, Last week what is left of my former girl friend was able to get her license back 2 years after her attempted suicide.She has a legal guardian and can't even tie her shoes,but somehow some paper work got scuffled and a computer glitch and she got license. She got scared the first trip out and has not driven since but when she does,I am scared for all on the road as she is documented by doctors not to be driving.We are naive to think the system protects us from dangerous folks. Her medicines alone are enough to put her legally under the influence. Just remember folks, we are all getting older. The speed limit is just that, the upper limit. The only roadways with minimum speeds are the interstates & freeways. Maybe they think putting an ambulance at the bottom of the cliff is easier than a fence at the top? Dont get me started about these people that drive 90 plus year old cars that only go 35mph and have no turn signals. Always holding up traffic and never seem to be in a hurry. They have to stop at every icecream shop they see! Oh, wait, thats me. Sorry. When my dad (1920-2016) was 94 the CA DMV sent him a 5 year renewal license in the mail. There was no test, eye exam, or anything. Just send a check and get your new license. Anything else would be "age discrimination". By that time he was well past being able to safely operate a motor vehicle. He had a couple of little incidents, but didn't (wouldn't) acknowledge his limitations. I was fearful for his safety as well as that of others. Believing that, as his only surviving child, it was my responsibility to take action I called his doctor. After a brief conversation he agreed to write to the DMV and state that Mr. Petrino, due to medical conditions, could no longer safely operate a motor vehicle. The DMV suspended his license. I lied about my roll in this for the rest of his life. The doctor was the a**hole who lied to the DMV. It was the right thing to do. Other "children" should take more responsibility for their parents and keep them as well as everyone else safe from the denial that is often present. There seem to be a lot of folks on this forum that like to say the speed limit is the speed limit. Yes, I understand that, but where I live, it is TRULY the norm for EVERYONE to exceed it. About the only ones who don't are the trucks on the interstate. They are usually at about 65. The vast majority of everyone else is between 5 and 10 over. It's just how it is. It is perfectly acceptable to law enforcement and they do the same. I'm curious to know if this is a regional thing or what? I've driven so far as PA and OH and find that along those routes it is pretty common to do at least 5 over if not a little more. When I'm out of state, I usually make it about 8 over, figuring that 10 could be their cut-off. I don't take off the cruise when I see a cop. I've only had two tickets in the last 20 years. Both have been on two lanes in small towns that I was not familiar with and let a speed limit sign go unnoticed, and both were in excess of 10 over. I've never had a speeding ticket for less than 10 over. Ever. Been driving for nearly 40 years. Never owned a radar detector. My great grandmother drove until she was past the point of "shouldn't". And she knew it. One day she was at the doctor and told him "I wish you would tell me not to drive anymore." He said "OK, don't drive anymore." And she didn't. I guess she could say her doctor told her not to and she was OK with that, and didn't have to admit she shouldn't be driving. Kinda gave her an excuse. I just about got run over yesterday in the T. I was driving 25 in a 25 zone when an old woman came up behind me doing about 40. Failed to see me and thankfully, slammed on her brakes just in the nick of time, skidded and just missed me. I was already 1/2 off the road thankful for my rear view mirror. This is mid day, bright sunshine, no excuses. These sorts of incidents have happened 3 or 4 times. I'm convinced that our speed in the Model T's is not the only reason we have impatient drivers that absolutely must pass us up! I can be driving the speed limit, or slightly over the speed limit in a 25, 30 or 35 mph zone in Seattle/Tacoma suburbs in my Model A or one of the T's, and quite often, some young punk will pass me and then slow down to the same speed I'm driving, or even a bit slower. I think it's some sort of "macho thing" that they just can't stand to have a old car in front of them. Weird,....!!! I was in the San Francisco bay areal last weekend hopping from freeway to freeway in 10 to 40 mile an hour traffic for a couple of hours (no it was not rush hour) when I realized that I could have driven my T and kept up with the traffic. Here in SoCal it seems like when you Can drive 90 lots of people are doing it an nobody cares. The key is speed difference, one slow car in the fast lane causes everyone to start switching lanes. I hate the racers cause sooner or later they'll cause somebody an accident as they out pace the traffic by lots of MPH. My pet peeve is Dark windows or tail lights. I like to see the other driver at inter sections or driveways so you can motion or signal whatever you want them and both know. The windows on many are so dark you can't even tell if someone is driving. Another thing I see more of is people coming up to a stop light will stop several lengths back behind the car in front. We have very limited room here on our crowded streets by the time all the widely spaced cars get to the light it turns red and you miss the signal Again. I think texting is the reason??? My last is people driving with their headlights off. Ya I know we have lots of street lights and it's hard to tell if your lights Are on with the stupid driving light makes people think they're lights are on but then they have no tail lights when they take off. Getting older our eyesight isn't like it used t be. The local paper had an article about the CHP and how shorthanded they are now in part because of so many Extra duties they've been assigned. Jason, part of the problem down in the Twin Cities is that the absolute volume of traffic has increased in the last several years, yet the available road surfaces have not kept pace in spite of lots of construction. All that congestion has seemed to create "combat driving" conditions for everyone. Trying to find less travelled, uncongested roads down there has become a real problem for drivers that don't want to drive like they are in the Grand Prix. I share the rural roads up here in vacationland with lots of those older drivers from MSP. They seem to have fewer issues driving around up here. Just the same, I try to stay on backroads any time I can. I have to say, the large majority of drivers out here in rural Western New York are courteous and friendly. I get more smiles, waves, and thumbs up than I can count when I go out for a putt. That said, I'm also very careful to pull over and let traffic pass at every safe opportunity. That's when I get most of the friendly gestures. Drivers really appreciate knowing that you know they're there and are concerned about their time and safety; not selfishly oblivious. Of course there is always one or two nutbags who shouldn't be insured who have to endanger everyone so they can arrive several thousandths of a second ahead of everyone else, but these clowns are far and away the exception, not the rule. I and my T have it pretty good and I'm thankful. To Scott: I remember seeing cow's with a warning device around thier neck--- a bell to warn driver's they there in the road! Learned to drive in Miami, Fl. Seen it all.